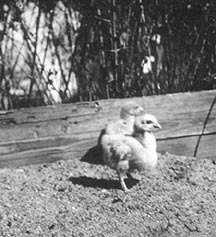 I had thought six years ago to write on the subject of Chickens... Not because of the existence of these pictures, (I didn't even put them together before yesterday), but rather because I remember these two chickens. Oh, I suppose over the years, the memory may have become distorted. Let me tell you the story. I have always felt that the chickens that have been so vivid in my mind's eye were the white variety. That way I can remember the sweet pseudo revenge that occurred when any chickens (with white feathers), lost their heads on the chopping block behind Ninno's house. Two at a time, they were then tied by their feet with a rope and flung over the clothesline to be bled. As they flopped around aimlessly, and I watched fascinated, I was secretly pleased. Hey, I'm usually mild mannered! How can this sort of attitude be tolerated? Let me explain. As confirmed by the above pictures the two chickens were family pets. As they grew up though, they lost their innocence. The picture taken at the bottom of the west steps, (by the way, I don't see any west porch in the picture), clearly shows this. It is plain to see that they were engaged in tormenting me, and I was bravely attempting to shoo them away, as others in the family were surely capable of. 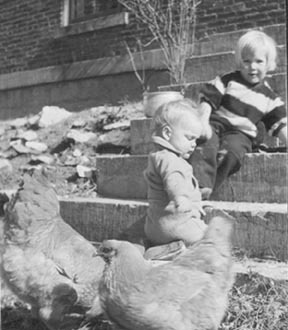 Well, I was not even two years old and I remember how huge those two chickens were. They seemed to tower above my head. How was I to fend them off? I couldn't and they knew it. Their favorite trick was to start pecking at my legs and get me running. There was no way to outrun them, therefore, all I could do was to get to the garage as fast as possible, screaming all the way inside, until Mom opened the kitchen door and allowed me the peace of the house. I do not know the fate of those two, but now you understand why I secretly enjoyed the beheading of anything fowl.